The MANJARA CHARITABLE TRUST, established in 1988, has been committed to the cause of education under the leadership of the great visionary and philanthropist, Shri. Vilasrao Deshmukh, former Honourable Minister of Science & Technology and Earth Sciences, Government of India. Shri Vilasrao Deshmukh´s inspiring spirit and persistent efforts have helped the Trust to grow from strength to strength. The prime objective of the Trust is to uplift and empower the younger generation, in both rural and urban areas, by making available quality school and college education in both technical and non-technical fields. Special focus is placed on women´s empowerment in rural areas and several all women institutions have been founded. Over the past twenty odd years, the Trust has further spread its wings and set up educational institutions ranging from K.G. to Graduate and Post Graduate programmes in various faculties including Arts, Commerce, Science, Technical Education and Management Studies. The Goldcrest chain of schools, launched in 2008, is the latest initiative of Shri Vilasrao Deshmukh´s to further his contribution to academic excellence. 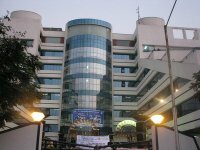 The first step in this initiative was the founding of an I.C.S.E school in Navi Mumbai in 2009-Goldcrest High, Vashi followed by Goldcrest High, Latur in 2010 and in 2013, Goldcrest International – an international school in Vashi, Navi Mumbai, offering the International Baccalaureate Diploma Programme (IBDP) – which continues the legacy of the Trust of moving forward “onwings of excellence” and establishing an environment “where excellence is a habit”. This entry was posted in Engineering, Engineering Colleges, Information Technlogy, Maharastra, Mumbai by eduportal. Bookmark the permalink.